From all-you-can-eat pancakes and endless bowls of pasta to free gifts and meals for runners. By Hunter Harris·	 4/14/2015, 12:57 p.m.
Anthem Kitchen + Bar in Faneuil Hall will be offering a bottomless bowl of pasta special on both April 19 and 20: orecchiette with roasted vegetables in a light tomato cream sauce for just $15. $15, April 19 -20, South Market Building, Faneuil Hall, Boston; anthem-boston.com. Take the Red Line to Kendall Square on April 19 for what Bambara describes as a “carb-centric pasta feast.” To help prepare runners for 26.2 miles on Marathon Monday, Bambara is offering a family-style, all-you-can-eat pasta feast served in a selection of sauces (tomato, alfredo, roast garlic tomato), proteins (chicken, sausage, shrimp), and pasta types (orecchiette, penne). The special costs $20 per person and is available for dinner alongside chef Jay Silva’s regular a la carte menu from 5:30 to 10 p.m.
$20, April 19, 25 Edwin H. Land Blvd., Cambridge; bambara-cambridge.com. In honor of the Marathon, this bistro is offering its own French-fueled fare: Saturday through Monday, diners can head to the Innovation District to enjoy Chef Adam Kube’s lamb spätzle with English peas, fava beans, and pickled ramps. $24, April 18 -20, 49 Melcher St., Boston; bastillekitchen.net. Patrons of this boutique hotel’s acclaimed restaurant can eat their weight in pasta all weekend. From Friday through Sunday, executive chef Lucas Sousa will have three separate Marathon offers on special: tagliatelle with wild mushrooms and charred bread; black pepper cavatelli with braised chicken and ricotta; and cannelloni stuffed with braised lamb shoulder, peas, goat cheese, and mint. Each dish is available in half- and entree-sized portions. 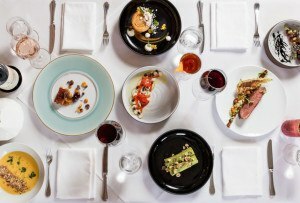 $14 for half portions, $24 for entrees, April 17 -19, 25 Charles St., Boston; beaconhillhotel.com. Hungry music lovers can enjoy live bluegrass music from 10 a.m. until 3 p.m. on Marathon Monday, as they enjoy brunch at this Harvard Square standout. Sunday night, however, is where the real carbs come in as both their Bowl Azteca (Adobo-spiced quinoa, tomatillo salsa, corn, squash, green beans, avocado, spinach) and signature Earth Bowl (five-grain pilaf, chickpea tomato stew, roasted vegetables, rainbow carrots, turnips, pumpkin, broccoli, tahini) will be available for $23. Relax with a healthy grain bowl, one of their 36 wines on draft, and a live music honoring the late Duke Ellington. April 19-20, 13 Brattle St., Cambridge; beathotel.com. On April 19, executive chef Marc Orfaly’s will be preparing carb-heavy pasta specials such as his swordfish puttanesca with tomato, capers, olives, and linguine; lamb shepherd’s pie with whipped parmesan potatoes; and chicken piccata with artichokes, broccoli, capers and gnocchi. And if pasta isn’t your thing, check out Orfaly’s decadent cheese and gravy frites, The Beehive’s in-house band will complement the evening with a Amy Winehouse tribute. Sunday, April 19, 541 Tremont St., Boston; beehiveboston.com. Chef Robert Sisca of Bistro du Midi is introducing a special menu over the weekend that includes a duck bolognese prepared with house-made garganelli and a rich bolognese made from ground duck, spicy pork sausage, red wine, and pork stock. Before being served, each bowl is topped with cabernet vinegar, olive oil, white peach, basil, and French feta. 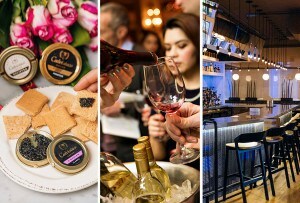 April 17-20, 272 Boylston St., Boston; 617-426-7878 or bistrodumidi.com. 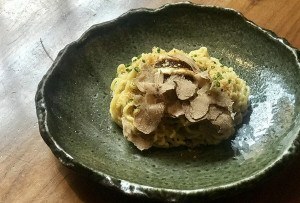 Coppa, Jamie Bissonnette and Ken Oringer’s outstanding South End enoteca, will be offering a special menu on April 19 called “Carb on the run at Coppa.” Starting at 5 p.m., you can purchase a Marathon-worthy bowl of spaghetti with the chefs’ signature meatballs and tomato gravy for only $20. $20, April 19 starting at 5 p.m., 253 Shawmut Ave., Boston; 617-391-0902 or coppaboston.com. When Tom Brady declared La Morra’s tagliatelle al ragù to be his favorite dish in the city, the Brookline restaurant saw a serious boost in business—so much so that it’s now simply referred to as “Brady Bolognese” by chef-owner Josh Ziskin and his team. Made with lamb, pork, veal, beef, and foie gras butter, it’s easy to see why the Pats quarterback is in love with this indulgent bowl of carbs. So really, the question is: Why wouldn’t you want to head to La Morra on April 19? Additionally, Ziskin will be preparing a number of pasta specials that weekend such as a beef agnolotti with butter and sage, a dish that he learned while working in La Morra, Italy. 48 Boylston St., Brookline; 617-739-0007 or lamorra.com. In addition to the Back Bay restaurant’s regular Meatball Sunday special, allowing guests to customize their own perfect meatball dish, diners can enjoy a Marathon pasta special, featuring MET’s “Not Your Nonna’s Carbonara,” served with rigatoni, chicken meatballs, pecorino and egg yolk ($23). April 19, 279 Dartmouth St., Boston; metbackbay.com. Joanne Chang’s funky South End favorite is offering a Southeast Asian alternative at this year’s Marathon weekend with its special $12 scallion pancake sandwich served with braised short rib, a fried egg, and mixed greens. And for those who’ve run the 26.2 miles and have a bib or medal to show for it, the restaurant will be offering a free glass of bubbles to celebrate their run. $12, April 19-20, 1145 Washington St., Boston; myersandchang.com. Pantry, the onsite restaurant located at The Verve Crowne Plaza-Natick, will help runners curb their carbohydrate cravings by hosting a Marathon Sunday pasta buffet from 5-8 p.m. on April 19. Executive chef Alastair McLean will prepare a duo of pasta plates including spaghetti with marinara and ziti laced with fresh spinach and walnut pesto, all for just $14.99. Reservations are required, so call ahead. $14.99 per person, April 19, 1360 Worcester St., Natick; thepantrynatick.com. Pastoral chef Todd Winer wants to help you get your glucose fix this Marathon with two great all-you-can-eat options. On April 19 from 4:30 to 9 p.m., choose between bottomless bowls of house-made chitarra noodles with spring vegetables or rigatoni with chicken and broccoli rabe for $24. Or go for the all-you-can-eat Neapolitan pizza (margherita or pizza bianco with spinach and sausage) for $23. 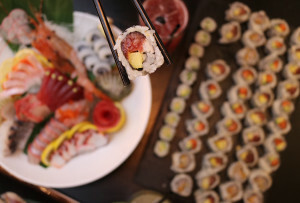 $24 per person, April 19, 4:30-9 p.m., 345 Congress St., Boston; 617-345-0005 or pastoralfortpoint.com. Starting this Friday, chef Brian Poe will be offering a Marathon pasta special of linguini with spinach, shrimp, cherry tomatoes, and jalapeño-spiced almonds for $15.95. Also, on Marathon Monday, the restaurant will be opening early at 10 a.m. for spectators who want to get one of the best seats on Bolyston: Poe’s’ rooftop patio overlooking all the action. 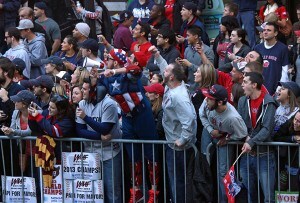 April 17-20, 384 Boylston St., Boston; 617-859-8555 or rattlesnakebar.com. Chef Dante de Magistris is bringing back his annual all-you-can-eat Pasta Marathon with entrees like his chitarra pasta with basil pesto, tufoli pasta with tomato basil sauce, and aglio e olio. Grilled chicken, salmon, or Dante’s famous meatballs can be added for an additional cost. April 19, 40 Edwin H Land Blvd., Cambridge; 617-497-4200 or restaurantdante.com. If anything, Marathon weekend is a celebration. So why not treat yourself and nab a reservation at Serafina Boston, the first New England installment of the legendary New York-based Italian eatery. Led by executive chef Brendan Burke, Serafina will serve a selection of pizzas, stuffed foccacia, and house-made pastas, including rigatoni alla bolognese; ravioli al tartufo Nero (black truffle ravioli); farfalle limoncello (bow tie pasta, baby shrimp, lemon zest, lemon juice) and gnocchi di mamma (homemade gnocchi, fresh cherry tomato sauce, parmesan, basil). 10 High St., Boston; 617-426-1234 or serafinarestaurant.com. South Street Diner is bringing back its legendary all-you-can-eat pancakes special, available for only $6. And for those looking to reload after the 119th running of the Boston Marathon, the diner will have a selection of post-race specials as well as a gift to anyone coming in with a finishing medal. April 19-21, 2-10 p.m., 178 Kneeland St., Boston; southstreetdiner.com. Both Strega locations (North End and Waterfront) are serving one of the restaurant’s staples at a special price. 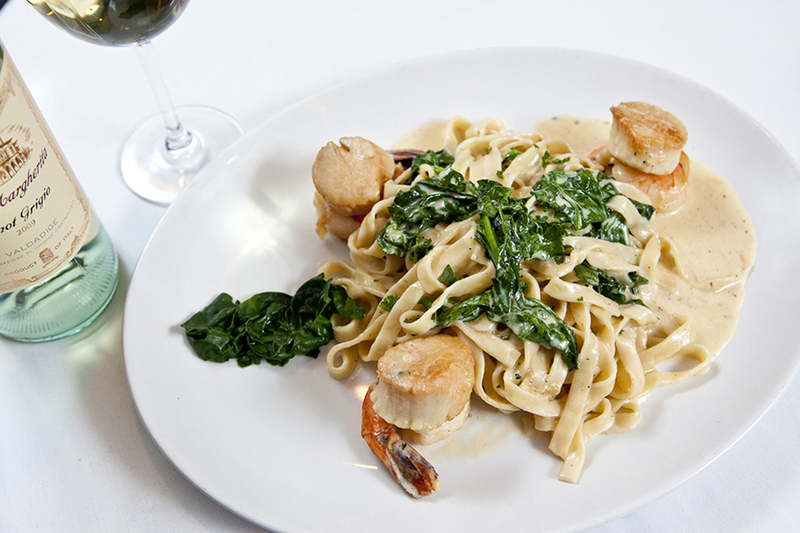 The Varano Group family of restaurants will serve a half-portion of Fettuccine Strega—fresh fettuccine pasta, jumbo shrimp, scallops, and wilted spinach tossed in a cream sauce—for just $15. Nico, the owners’ Italian wine bar and lounge, is also offering the pasta deal. $15 per person, April 19-20, Strega Waterfront, One Marina Park Dr., Boston, stregawaterfront.com; Strega North End, 379 Hanover Street, Boston, stregaristorante.com; Nico, 417 Hanover Street, Boston, nicoboston.com. Dig into any of Michael Schlow’s pasta entrees at Via Matta on April 19 and get a free appetizer on the house. As a special offer, every table that orders at least one pasta dish during dinner service will receive a complimentary order of house-made ricotta with sage, extra virgin olive oil, hot chiles and crostini. Drink your carbs on Marathon Monday and raise a pint to all the Marathon finishers. 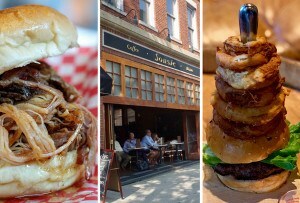 To help celebrate, the Cambridge craft beer bar will be offering free meals to all the runners. Choose from a limited menu featuring their eight-ounce Hobo Burger, the veggie burger (lentils, quinoa and rice) topped with crispy wontons, and more. 92 Hampshire St., Cambridge; 617-250-8454 or lordhobo.com.